Around eight in the morning, we boarded the bus in Saigon for the six hour trip to Phnom Penh, Cambodia. Sure, it was a long bus ride but it only cost $12 per person and they assured us there would be no livestock travelling with us. It was pouring that day. 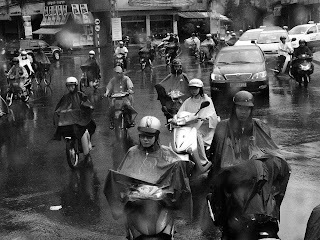 This did not deter the army of motorcycles swarming the city. I was AMAZED that I did not see more accidents. We arrived in Phnom Penh in the early afternoon and the city was much more charming than what I thought it would be. I guess I expected an urban toilet but instead, I saw parks, beautiful architecture, and a much more laid back atmosphere than Saigon. 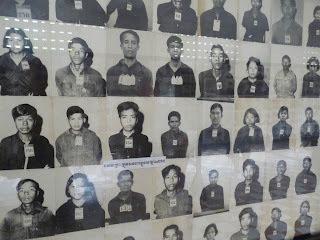 One of the main reasons why I wanted to come to Phnom Penh was to get a glimpse of Cambodia's very dark past. If you're not familiar with their history, let me give you a little bit of background. In the spring of 1975 as Saigon was falling (or being liberated depending on which side you were on), Cambodia was just beginning a period of intense turmoil. Pol Pot, the leader of the communist movement called the Khmer Rouge, took control of Phnom Penh and started making up his own rules. He changed the name of the country to Democratic Kampuchea, abolished religion and enforced the concept of "Year Zero", which meant that a new civilization was being created. The population was forced into the countryside to do backbreaking labor for no pay. Pol Pot's ideal society was an agrarian one; everyone worked in the fields. Pol Pot and his Khmer Rouge army began a reign of paranoid terror. They killed off anyone whom they thought might have an opposition to their new government. They tortured prisoners to get more names. Their biggest fear was the KGB or the CIA, but even religious subjects were targeted. Nobody knows for sure how many people were killed during the four years of madness but I have read numbers from just less than 1 million to three million people. Women, children and babies were not exempt from the killings. 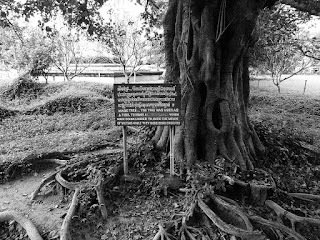 As a memorial to all the lives that were lost, visitors to Phnom Penh are able to visit Tuol Sleng, otherwise known as S-21, which was just one of the torture/execution centers for the Khmer Rouge. 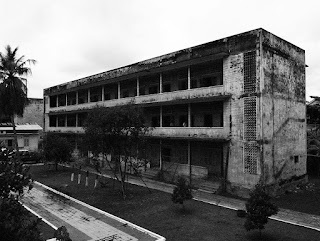 Strangely enough, Tuol Sleng started out as a high school. 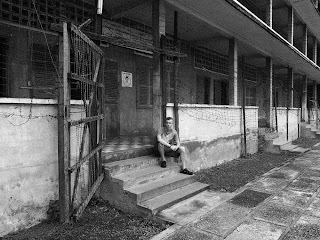 It is estimated that 17,000 prisoners were held here but only seven were found alive when the Vietnamese took over Cambodia. 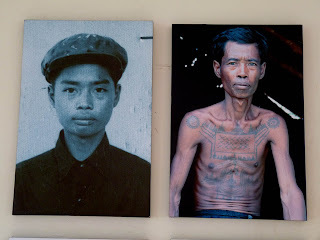 The seven survivors had their lives spared because they had talents which the Khmer Rouge found useful. 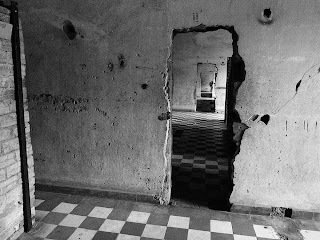 This is Tuol Sleng. Nice eh? Inside the building are some very creepy photographs of the victims. 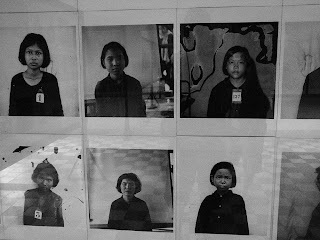 The Khmer Rouge was apparently very good at record keeping and they took pictures of all the new arrivals. What I found most disturbing (in a very disturbing place) were the photos of all the children. A lot of them had very detached expressions as if they weren't fully aware of the tortured death that they were facing. Tuol Sleng is a very tragic place. Almost overwhelming. It's difficult to believe that someone could have done to this to his own country. Sadly, Pol Pot died in 1998 of possible natural causes. He was never brought to justice for the genocide. A cat was sleeping peacefully near one of the exhibits, completely unaware of the horrors that happened there thirty years ago. As you might expect, some of the Cambodians joined the Khmer Rouge army to save themselves or their families. 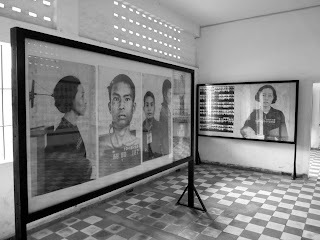 In one room, they showed some of these people during the time of the Khmer Rouge regime and in present day. They told their stories and many of them didn't regret the choices that they had made. 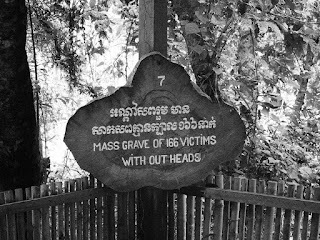 Since Tuol Sleng wasn't enough misery for one day, we decided to take the tuk-tuk out to the infamous killing fields which are located about 30 minutes outside of Phnom Penh. 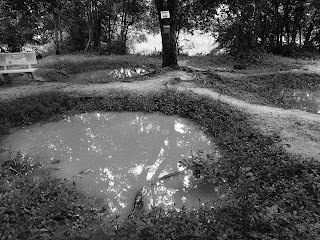 For a great movie which dramatizes the horrors of this location, check out The Killing Fields, directed by Roland Joffe. Haing S. Ngor won the academy award for Best Supporting Actor and he was also a survivor of the Khmer Rouge regime. In a strange but sad twist, he was shot to death in Los Angeles in 1996. 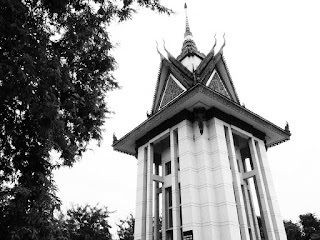 At the entrance to the killing fields is a monument to all the people who lost their lives. It is filled with skulls and other assorted bones. Many of the victims were stabbed or bludgeoned to death. 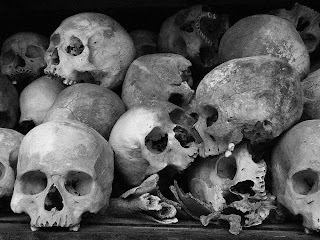 The Khmer Rouge did not want to waste their precious bullets. 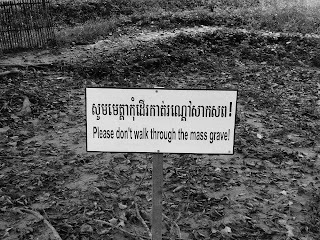 Many of the mass graves still need to be excavated. 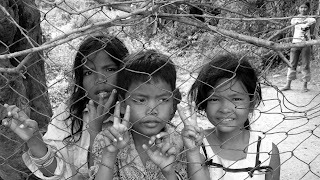 Cambodia seems to be a country that is missing an entire generation of older people and so even the killing fields had their share of children running around. Of course, they all want money and we were told by many people that we should NEVER give money to the children if they are begging. The children are often being pimped out by their parents to get the money and they'll never see their share of it. The other reason is that begging can set them up for a life of dependency. These three kids followed me around while I was taking photos. They had their English lines memorized, "One, two, three, SMILE!" which they followed up with hands clasped in prayer and a very odd, mechanical (almost creepy) song. They wanted a dollar for their efforts. It was really hard to tell them no. Their smiles seemed very out of place for this somber location.